Investment shares: for-profit businesses can issue shares, following the securities laws that regulate these. In Canada, there are significant barriers to investment through shares or bonds in local companies for non-accredited investors. The status of accredited investor depends on an annual stable income of over $200,000 (or $300,000 with a spouse), or financial assets worth over one million (net of liabilities) or net assets over 5 million. In some cases, shares with co-operatives are RRSP eligible. Co-operatives are governed by the Co-op Act rather than the Ontario Securities Commission, but the registration requirements over a certain exempt amount is similar, and requires a considerable expenditure in lawyer fees for the offering statement. 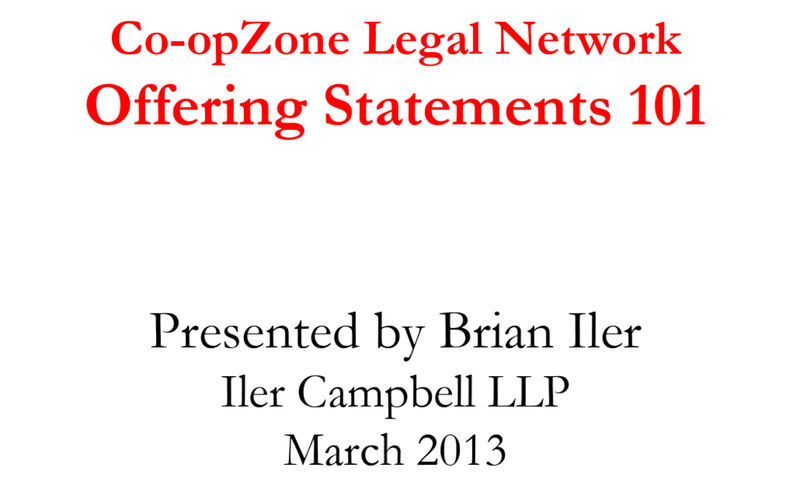 This PowerPoint presentation by Brian Iler reviews the basics of offering statement requirements for co-ops. Click to view this PowerPoint presentation. This PowerPoint presentation by Brian Iler reviews the basics of offering statement requirements for co-ops. Click to download this PointPoint presentation. This presentation from Peter Hough of the Canadian Worker Co-op Federation explains the applicability of RRSP to capitalize co-ops. Click to view this PDF. Community bonds: Community bonds can be used by any business (including a not-for-profit) to capitalize the business through debt. Bonds are generally issued with a certain interest rate and term. They can be designed to automatically roll over at the end of the term. Community bonds have been used by many co-ops (such as the West End Food Co-op) as well as not-for-profits like the Centre for Social Innovation to raise money for their businesses. For profits can issue bonds and shares; shares have the flexibility of allowing annual dividends to be based on performance rather than a debt instrument with a set interest rate as in the case of bonds. TREC (Toronto Renewable Energy Co-op) has managed the bond issues for a number of renewable energy co-ops and other organizations, and now offers services to help businesses develop their own bond offering. Promissory notes: Simple I.O.Us have been used to raise money for farm businesses, often drawing on capital from the producer’s own network of friends and family. This article describe how Ruth Klahsen of Monforte Dairy raised over $300,000 to leverage the funds she needed to re-open her cheese business. She raised the money through “subscriptions” that could be exchanged later for cheese when she began production. Venture capital: Venture capital has had little interest so far in the food and farm sector due to low margins and volatile markets. Some very large companies have attracted investment from Investeco and others, but in general this is not a likely source of funding for producers who are just beginning to expand from direct sales. 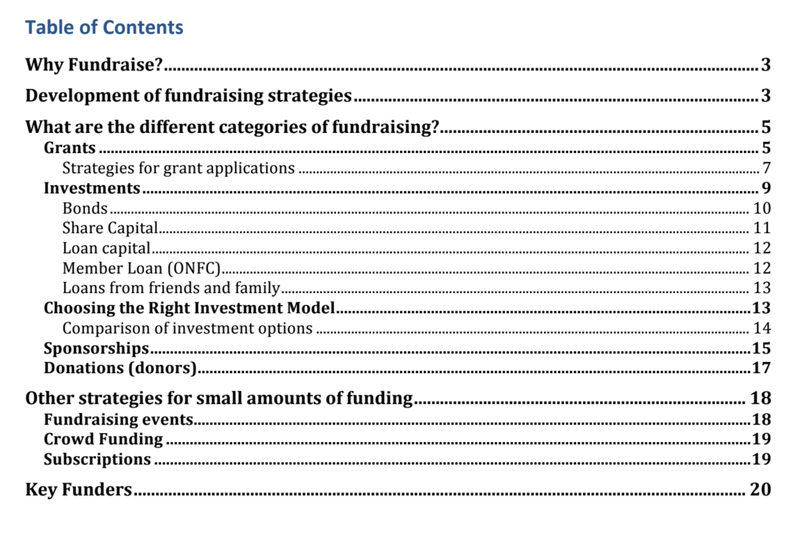 Grants: The toolkit below offers some ideas on sources of grants. To use this option, you should check deadlines and opportunities regularly, as they change frequently. Government programs: OMAFRA (Ontario Ministry of Agriculture, Food and Rural Affairs) offers various programs, resources and trainings that can support expansion of food and farm businesses. Menu Selling Food to Ontario Workshop. Click to view this PDF. 4. Credit unions, banks: The material produced in this course can prepare you to approach a bank or credit union for financing. You need to plan your presentation ahead of time, addressing the concerns of these lending institutions professionally and honestly. This video from Kindred Credit Union provides information on what a commercial lender is looking for, and how to make your application effective. 5. Community Futures DCs: Many rural regions in Canada have a Community Futures Development Corporation. They may offer funding options, usually loans or small grants, and will provide expert advice as well. Each one provides different programs, so contact the one in your area to see what they offer. You can start here at the central website for Ontario’s CFDCs to see if you have one in your region and what they offer. Donations: Donations are unlikely to raise the funds you need to expand a business. They are most likely to be significant if you are able to show social or environmental benefits and goals in your project. In general, they can be successful if a business is soliciting them for something specific that is part of their operation. For instance, Everdale is a farm business that also has educational programming. The educational parts of such a business can incorporate separately, access charitable status, raise money from donors and provide tax receipts. In another example, Black Creek Community Farm may not be able to raise donations for the farm business itself, but is likely to be able to raise money from donations for their social justice projects in one of Toronto’s low income and food insecure communities. Crowdfunding: New regulations have increased the amount that non-accredited investors can invest through crowdfunding. The maximum remains at $5000 (for co-ops, exemption allow investor more than that already). The approach has been successful for specific equipment needs. Examples include a delivery truck for Roots to Harvest in Thunder Bay, a not-for-profit market garden that works with street-involved youth; a key piece of equipment for Together We’re Bitter, a new craft brewery in Kitchener, Ontario. Friendly/ patient capital: This model encompasses several of the options above. The money can be conveyed through different methods (loans, shares, bonds) but the principle is the same: no expectation of a high or rapid rate of return. The Slow Money movement championed by Woody Tasch has developed this idea but it has not had a significant impact in Ontario yet. You can learn more about the Slow Money movement here. A financial sources planning worksheet. Click to view this PDF. The worksheet on the right describes some of the options and gives you a table to begin to estimate sources, risk and likelihood. Once you have identified your target sources, you will need action planning (module 6) and a modified market planning for your capitalization campaign to develop materials and messages to solicit funding. Even if you plan to rely on grants or government programs, it is good to spend time with the team to develop a one-page summary of your pitch. This can be used over and over again. Share it broadly with team (and Board if you have one) to ensure that everyone is aware and engaged with the process and strategic direction. Consider providing training on how to talk to potential investors, and how to respond to difficult questions. This fundraising toolkit was designed for co-ops in the food and farm sector, but contains general information about many of the options listed above. In many cases, the material is applicable to any structure. Click to download this PDF. As your business expands, you will need a reliable accountant who can help you assess in advance the tax impacts of the changes you are making. These are complex and vary from one location and structure to another; it is indispensable to consult an expert to ensure you approach these issues with full knowledge. For instance, a farm that adds a value added operation can face a significant tax increase as an industrial rather than agricultural site. For-profit businesses and not-for-profit businesses have different options and advantages for food and farm businesses. As a reminder, not-for-profit businesses can still end up with a positive bottom line, but it must be handled appropriately. 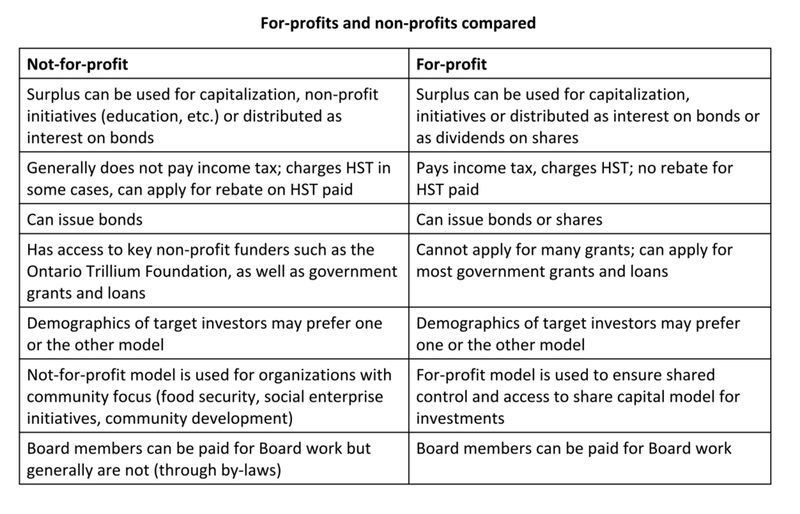 Businesses with significant social or environmental benefits in their goals may consider not-for-profit status because it affords access to funding (foundations, grants) that for-profits cannot access. This table shows some of the differences to be weighed when deciding on a tax status for your business. Click to download this Word document.